Gift Fundraising provides parents with the opportunity to purchase great gifts for their family and friends knowing that a percent of their order makes its way back to the Ben-Hem PTO. Each year, the Ben-Hem Art Teachers work with each student to create a unique, one-of-a-kind masterpiece. Square 1 Art then offers a catalog of great gifts that parents can order featuring their student's artwork. This is a great opportunity to buy gifts for yourself, your students, your family and your friends. Parents love this fundraiser because it captures a snapshot of their child's creativity each year, and earns up to 38% profit for Ben-Hem. For earlier gift-giving, please print a "Your Gift is Coming Soon" Card, below, to give to family and friends. EACH CARD IS AVAILABLE FOR DOWNLOAD BELOW. Cards are slightly smaller than 5x7 envelope. Pick a design that works for you. 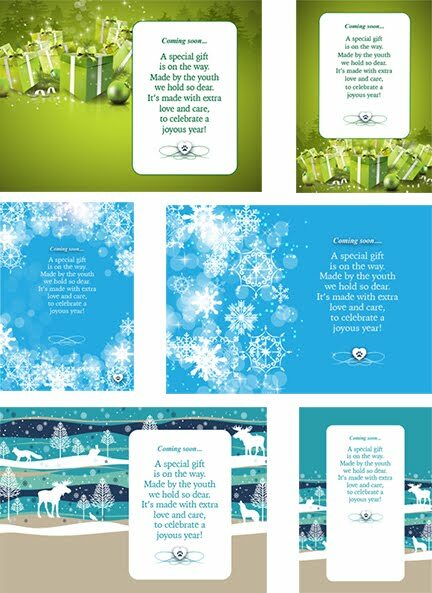 Themes: Gifts, Snowflakes, and Woodland. Each card has plenty of free space -- add one of the complimentary stickers you received! Each reads: "Coming soon...a special gift is on the way. Made by the youth we hold so dear. It's made with extra love and care to celebrate a joyous year!"